The city of Entebbe, Uganda, is located on the shores of Lake Victoria about 22 miles south of Kampala, the nation’s capital. In addition to being the official residence of the president of Uganda, Entebbe is the site of the nation’s only international airport. On June 28, 1976 Air France flight 139, en route from Tel Aviv to Paris, was hijacked by members of the Popular Front for the Liberation of Palestine (PFLP) and two German accomplices shortly after a scheduled stop in Athens, Greece. After the hijacking the Airbus A300 jet was flown to Benghazi, Libya for refueling, and then on to Entebbe, Uganda where they expected a supportive reception from the pro-Palestinian Ugandan government headed by dictator Idi Amin. After landing at Entebbe, the 103 passengers on board who carried Israeli passports or were Jewish, were detained while the remainder of the passengers were eventually released. Additionally, more terrorists joined the hijackers on the ground in Uganda, reinforced by members of the Ugandan military. 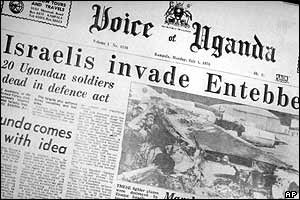 At just after 11 p.m. local time on July 3rd Israeli commandos landed at Entebbe Airport to begin a carefully planned rescue attempt. Planning, preparation, and execution of the raid was made easier because the new buildings at the airport had been designed and built by Israelis, and thus the commandos were able to familiarize themselves with the layout. Using four C-130 Hercules aircraft, the Israeli military secured the airport perimeter and entered the terminal building where the hostages were being held. The commandos were successful in extracting all but three of the prisoners being held in the terminal. All of the hijackers were killed along with 45 Ugandan soldiers. Most of the Ugandan Air Force was destroyed on the tarmac at the Entebbe airport during the raid. The only casualty suffered by the commandos was the death of Lieutenant Colonel Yoni Netanyahu, older brother of future Israeli Prime Minister Benjamin Netanyahu. One hostage, 75-year old Mrs. Dora Bloch, had been taken to a hospital in Kampala and had to be left behind. She was later taken from her hospital bed and murdered. Following the raid the Israeli planes refueled at Nairobi, Kenya, where a medical plane also awaited those in need of attention. Because of their cooperation with the Israelis in this incident, the Kenyan government was condemned by the Organization of African Unity (OAU). Henry Kyemba, A State of Blood: The Inside Story of Idi Amin (New York: Grosset & Dunlap, 1977); M. Louise Pirouet, Historical Dictionary of Uganda (Metuchen, N.J.: The Scarecrow Press; http://operationentebbe.com.